Very good prices on most items. Have a price match guarantee! 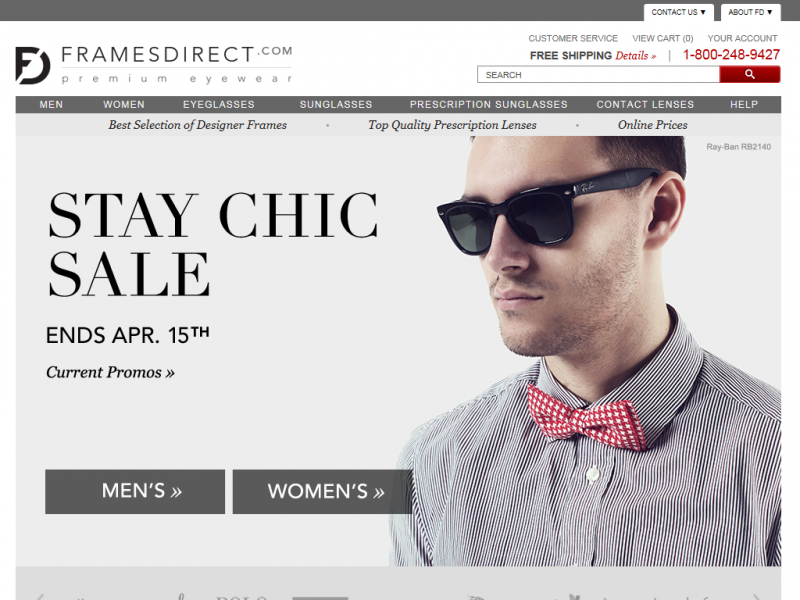 FramesDirect.com has one of the largest selection of frames online. They carry more than 500 brands of eyeglasses, sunglasses, prescription sunglasses, contact lenses and goggles (swim and ski). When you combine that with the different models and colors available, this means they have more than 100,000 styles of frames to choose from. Price wise you can expect their prescription lenses and frames to cost about half the price you would pay at most retail optical chains. FramesDirect.com also sells a wide range of contact lenses from all of the popular manufacturers. FramesDirect launch almost 20 years in 1996 and was the first online eyewear store and in 2003 they were also the first company to sell contact lenses online. They continued to innovate and by 2005 had a partnership with Oakley to sell prescription sunglasses (again another first). In that same year they also launched on their website the FrameFinder Virtual Try-On System (more about this feature later). Because of their standards in quality and the amount of selection they have FramesDirect remains one of the most popular eyeglasses online retailer today. 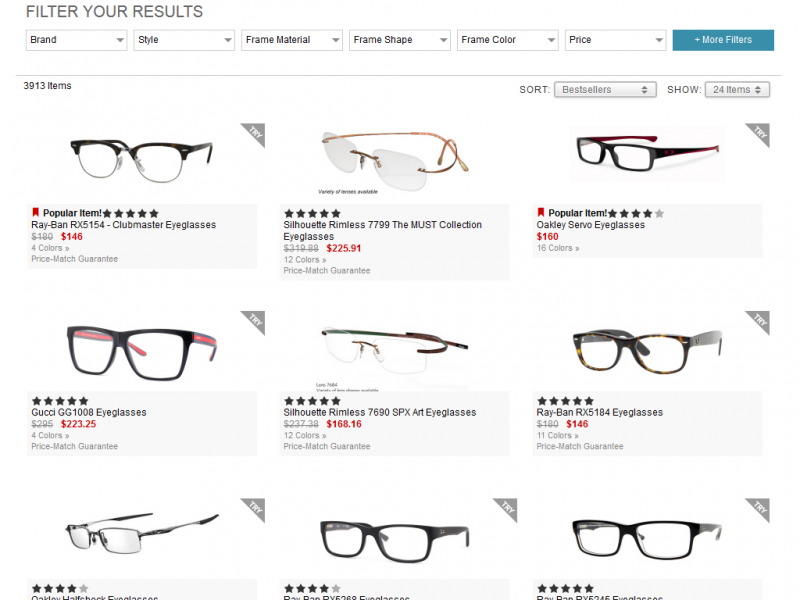 To find the frames you want FramesDirect has their glasses split up into easy to understand departments (or categories). From the main dropdown menu you can see the frames laid out by type, gender and styles. When you click on what you are looking for you are then brought to a gallery view of the search results. From here you can sort your results by a number of attributes including price, bestsellers and model. You can also filter your results further by Brand, Style, Frame Material, Frame Shape, Frame Color, Price, Size, and Frame Type. It can be hard to buy eyeglasses without seeing them on. FramesDirect has the next best thing to a mirror and that is their Virtual Eyewear Try-On tool. On any frames you like you can click the "Try" triangle in the corner of the frames picture. This will bring up a page which shows the glasses on a male or female model. You can choose from several different models that may match your look, or you can upload your own selfie that will allow you to see what your glasses may look like on you. After you pick your frames and proceed to the check-out you then have to pick your lens type (you can select no lenses if required). Free UV Protection, Edge Polish and Scratch Coating is included with all lenses. Depending on the frames, you can pick from single vision, progressives, and bifocals. For tinted or polarized lenses you will need to call FramesDirect at their 1-800 phone number. Once you pick the type of lenses you then supply your prescription (you can save your prescription to your account for other frames as well). Then you select your lens material and thickness. There are 4 options which range from $45 for the basic plastic lens to $230 for the thinnest Hi Index 1.74 lens. The final lens options for you to choose from includes a premium glare-free anti-reflective coating ($75), transition light adjusting lenses (3 color options at $70), and UV protection (which is included for free). Each lens from FramesDirect must undergo a 6-step quality assurance process and verification using high-tech digital lens technology. This ensures total accuracy of your prescription and lenses that are free of scratches, distortions and defects. With contact lenses FramesDirect saves you money since they get huge volume discounts on many name brand contact lenses. They pass the savings onto you with great prices and discounts towards regular eyeglasses. Searching for contacts is easy. You can go to directly the brand you want from the main menu or filter your search results by Manufacturer, Brand, Frequency, Lens Type, Special Needs (dry eye, astigmatism, toric, etc. ), and Cosmetic (eye color changing). Once you click the lens you want you are then brought to its product page which contains the details about the contacts. From here you enter your prescription and then you can add it to your cart. Under their quality assurance program FramesDirect.com offers a 1-Year Manufacturer's Warranty on all of the frames and lenses they sell. With the warranty FramesDirect will either repair or replace your eyeglasses free of charge. Rough handling and prolonged exposure to water or exposure to excessive heat and cold is not covered. FrameDirect does ask you not to attempt to repair your eyewear yourself. They cannot accept products that have been tampered with for repair/replacement under a manufacturer's warranty. Also if your eye doctor makes any changes to your prescription within 30 days of getting your order FramesDirect will make new lenses for your frames and ship them to you at no cost. If your prescription changes within 90 days then you can receive your new prescription for 50% off the retail cost. 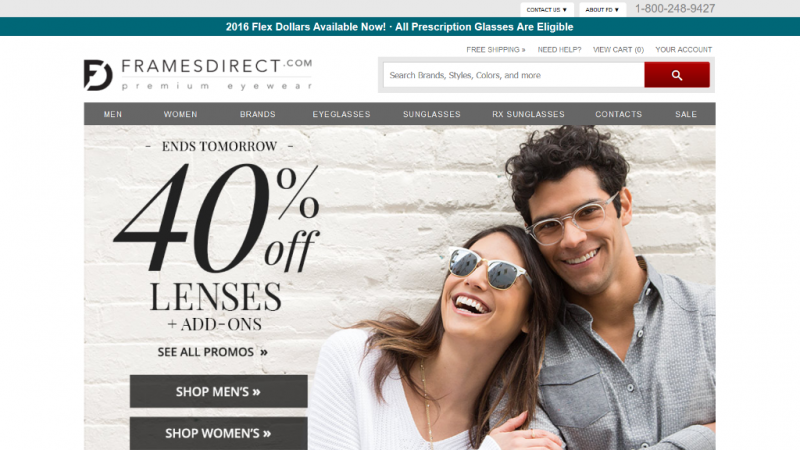 For 14 days after you place your order, if you find eyeglass or sunglass frames of the same color and style number for a lower price on another US website, FramesDirect will match that price. This guarantee does not include certain brands like Oakley (7 in total) and the price being matched cannot be a promotional price or a rebate price. Prices at Amazon.com are excluded along with auction sites like Ebay.com. This guarantee is for the frames only and does not cover the lenses or contact lenses. FramesDirect.com is an out-of-network provider for most insurance plans. This means if you wish to be reimbursed for your prescription order you will have to fill out a reimbursement form. FramesDirect offers forms for 8 different popular insurance providers along with the details of how to submit the form to them (along with your FramesDirect receipt). They have also included a generic form for other insurance providers. You can expect lower costs than any physical retail store at FramesDirect for both eyeglasses and contacts. Their prices are one of the lowest on the internet especially for name brand frames. If you do happen to find a lower price after you place your order then you will be covered with FramesDirect price-match guarantee (see above for more info). You can purchase your glasses and contacts in the following currencies: USD, CAD, GBP, AUD, EUR, plus others. FramesDirect offers a sister site called AFEyeWear.com. This site offers deep discount on frames and lenses (as low as $39 for both). This site is only for U.S. Military, Veterans, Police, Firefighters and EMS Personnel (and families). There are plenty of shipping options with FramesDirect.com and for any of these options they require 3 business days for processing your order. Their most popular option is the free shipping which goes by the United States Postal Service and takes 4 to 5 business days (so a total of 7-8 business days with processing). Note: free shipping applies to the contiguous 48 U.S. States only. Your next quickest option for shipping would be UPS Ground for an additional $4 USD. This takes between 5 and 7 business days in total and also allows you to track your order. Priority Shipping is an additional $9 and takes 6 business days, and finally UPS Expedited Shipping allows you to get your order in 4 business days for $15. You can also ship your order to any country for an additional cost which will be shown when you are about to pay. International order costs do not include custom or duty fees to bring your order into your country. The great thing about Frames Direct is that they have both eye glasses and contact lenses. I wear both so this is very convenient when I can order both from the same store, which I generally do at the same time. My glasses are for everyday use. I put in my contacts sometimes when I go out at nights with friends, and when I play sports like hockey. Selection for contacts isn't super important to me since the only thing I am concerned about is that the store carries my brand which is Acuvue (which Frames Direct does). 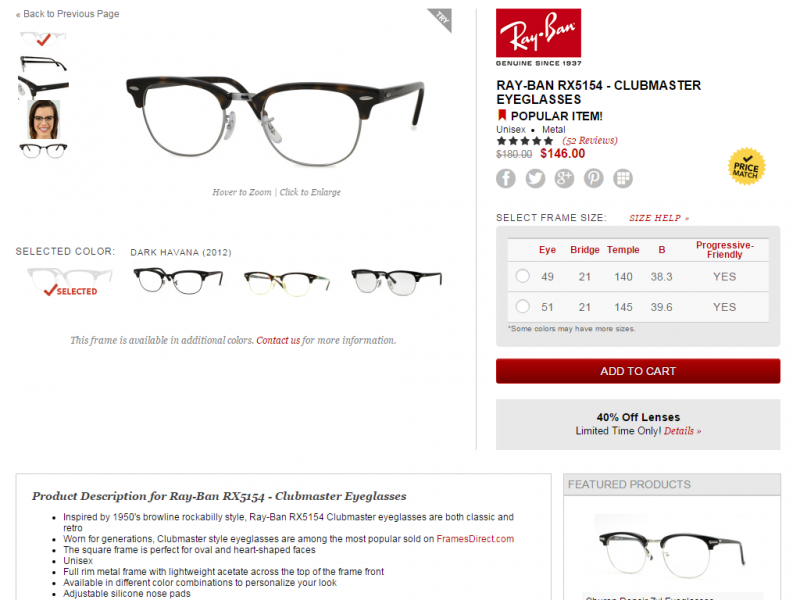 I am picky about my eye glasses frames and Frames Direct does have a huge selection. When I do change prescription which unfortunately seems to happen every 3 years now, I usually get 3 pairs. 2 regular glasses and one pair of sun glasses. I like to think of myself as fairly style conscious so it is important to me that I have a variety to choose from. The virtual eye wear try on tool is also great since I have my own photo stored with my account that I can use to apply the frames I am interested in. I also haven't had any problems with my insurance company accepting the forms from Frames Direct. It is one thing I don't want to have a hassle with. I did about 10 years ago with another eye glass store which I never want to go through again. I was very impressed with selection. However, when I got my glasses I couldn't see clearly. I called FD and they encouraged me to 'give them a while' to adjust to progressive lens. I called at the 1-month mark and said I still can’t see correctly and can't wear them. In full disclosure they offered that I could send them back and they would look at them. I said I can tell the lenses have the pupils placed in the wrong location, and looking at them wont help. So they said I could take them to an eye doctor and get my PH/PD measurements taken. So I scheduled another eye doctor appointment. Doctor confirmed the Pupil Height and Distance was placed incorrectly by Frames Direct for both eyes. I contacted Frames Direct and informed them that a doctor confirmed they were made incorrectly. They requested I go back to the doctor again and have the doctor put dots on the lenses where the pupils should have been and then send them back. I scheduled with doctor again. I sent them back with dots on the lenses. FD could see glasses and lenses were in brand new perfect condition and still are. They informed me that now too much time has passed and I will have to pay again to have my lenses made correctly. (but they would offer a 50% discount). Fine Print at Frames Direct states if you contact them within 30 days and notify them of difficulty they guarantee replacement. I did contact them within 30 days, and followed their instructions and they still refused to replace the lenses. Again, in full disclosure, it did take me a couple months to schedule the 2 doctor appointments required due to business travel. I clearly communicated this with them and they encouraged me to still schedule the 2nd appointment and have the dots marked on the lens in the correct spots. When I sent them back as we had discussed, they refused to correct the lenses and sent them back in unwearable condition with the brand new premium all options package including dark transitions lens that is useless. 100% confirmed a MFG error based on their proprietary CD selfie system and would have been So easy to resolve now with accurate measurements provided at their request. This was my first time ordering glasses online. Wasn't sure if it was going to work out as it is much easier to try on frames than to rely just on the measurements of your previous glasses. It did work out though and I really like the new frames I picked out. Plan to buy my next pair this way since it is much cheaper even though you do have to be a bit more careful double checking the measurements. DO NOT PURCHASE, despite numerous emails stating they cannot process my order, when told to cancel they attempted to charge a 10% restocking fee! FORWARD to all your friends and avoid! They are pretty similar to my old ones except much lighter. I had upgraded lenses installed and they made my new glasses look really good. I picked these frames because they look good and they are almost Indestructible, and they weigh almost nothing. Combined with the upgrade lenses which are much thinner these new glasses from Frames Direct are the lightest pair of glasses I have ever owned. Read the fine print and know they don't value you. This is a company that has no interest in you as a customer. They measured my eyes wrong based on some terrible photo thing they make you send in, they didn't inform me that they can't fill my prescription the same as my local eyeglass company because they don't offer the same options but put my order through anyways, and charged me over $200 for cancelling my order of $700 because it was already in the lab. They were willing to change the lenses though for free (meaning they would throw the old lenses away and make new ones, yet they would not credit me back for my full purchase. After hours on the phone with framesdirect.com I realized they were not interested in helping. I filed with the Texas AG and will also file with my local AG as well. I took my complaint all the way to the top and was greeted with "you should read the fine print". Perhaps I should have, but then I thought maybe you would be a reputable company. A special thanks to Kelly S and Travis G for wasting and additional 2 hours of my time just to tell me that you won't help me. Like the Comcast of eyeglasses. Trust me when I say it's not worth the "savings", my local place ended up being cheaper anyways and get this... they value me as a customer!